Being diagnosed with pulmonary fibrosis can be life crushing. A dilapidating, progressive lung disease, pulmonary fibrosis is chronic and often deadly depending on what stage you are in and what level of severity that stage encompasses. There are four distinct stages of this life-threatening disease: mild, moderate, severe and very severe. The type of treatment you can receive often depends on the level of PF diagnosis you receive. What Does Pulmonary Fibrosis Do to Your Lungs? Pulmonary Fibrosis is a chronic and progressive lung disease. It develops when the tissue of your lungs becomes scarred and damaged. The scarred and damaged tissue thickens and stiffens, making it progressively harder for oxygen to pass into the bloodstream. As the tissue of the lungs thickens, the lungs stop functioning properly, and over time they will begin to fail. It is very rare that the exact cause of pulmonary fibrosis can be pinpointed. There could be any number of factors that lead to a diagnosis. Long-term exposure to certain types of dust from coal, grain or silica can scratch and tear at your lungs over time, causing permanent damage. Occupations that involve working with metal cutting that exposes you to hard metal dust and fibers can do the same. Even constant exposure to animal feces can eventually cause PF. Pulmonary Fibrosis can also be the unfortunate result of certain medical treatments for other diseases. Radiation therapy for cancer is the most common treatment that can cause this kind of permanent damage to your lungs. 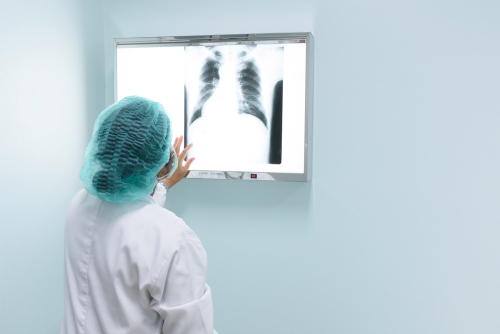 Breast cancer and lung cancer treatment can both expose the lungs to extended periods of radiation that can result in long-term damage and scarring. Certain medications and drugs — like chemotherapy drugs, Cordarone for heart problems and antibiotics like Macrobid — can also cause enough damage to your lungs over time to result in permanent tissue hardening. Sicknesses like pneumonia and other respiratory viruses like influenza can irritate the lungs to the point of causing permanent damage if they last too long. Prolonged, deep-chested coughing and fluid in the lungs that makes it hard to breathe can leave heavy scarring that cannot be repaired. Even auto-immune diseases like rheumatoid arthritis can cause pulmonary fibrosis. Unsurprisingly, both smoking and second-hand smoke exposure can create complications for your lungs that lead to PF. Smoke has long been known to cause all kinds of complications when it comes to your lungs. If you don’t develop PF directly from smoking, you can develop it because of lung cancer and radiation therapy for that cancer. This could manifest right after treatment or years later. Many different conditions, treatments, medicines and other substances can trigger this disease, but the truth of the matter is that most of the time a cause cannot be found, and doctors are left guessing. This can make finding a way to treat it even more difficult. Pulmonary fibrosis without a known cause is called idiopathic PF, and it is the most common form. The symptoms of pulmonary fibrosis can look a lot like the symptoms of other diseases. Alone and for a brief period, they could be a result of any number of things and should not be taken too seriously. A combination of the following for a prolonged period is cause for concern, however. Every case of pulmonary fibrosis is different, so the prescribed treatment will vary based on the individual and how severe the case is. If you have other health issues besides PF, this could limit your treatment options. If you’re already at the most severe level of PF, this could also limit your treatment options. The range of treatments narrows depending on how early the doctor catches the disease. Treatment can be anything from lung exercises to medication and therapy. If your doctor measures your oxygen level through all the different activities you do on a normal day and sees that it consistently drops below 88 percent, he may prescribe oxygen for you. 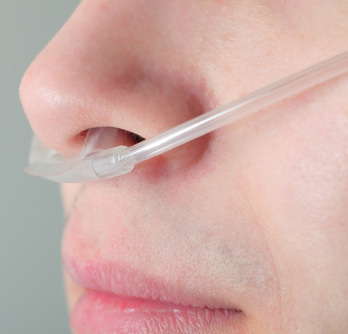 This means you will be given an oxygen tank and tubes connected from the tank to your nose that administer oxygen to help you breathe. The tank can be frustrating to lug around and embarrassing for many, but the benefits often far outweigh the downsides. Oxygen therapy can allow you to be active and do all the tasks you have always done without struggling with shortness of breath and the sore muscles and joints that can accompany a bloodstream that doesn’t get the oxygen it needs to function correctly. This brand of therapy covers a multitude of problems that accompany pulmonary fibrosis, from the physical to the emotional to the mental. Pulmonary rehabilitation helps people fight breathlessness and the plummeting mood swings that can accompany the realization that you can no longer do things the way you did when you were healthy. This involves a specialized doctor coming to your home or giving you inpatient therapy. The therapy can include exercise training, counseling, nutritional aid and breathing exercises that help expand your lungs. You will also be educated on the chronic disease you are living with so you can better prepare for the future and improve how you deal with the present. This is an explorative form of treatment for pulmonary fibrosis. Curative care allows a person to be a candidate for experimental treatments and PF research. This can involve anything from being placed on newly discovered medications that are going through the testing phase to being evaluated for a lung transplant. Not everyone can or should seek out this type of care. Much like palliative care, it is often better to wait until your symptoms are more severe before you resort to these kinds of measures. Most drug therapies are only capable of slowing down the destructive effects of pulmonary fibrosis, and many of them come with a risk of negative side effects. Drugs like prednisone and mycophenolate mofetil can treat inflammation in the lungs and slow the decline in their ability to function. Taking these drugs can cause mild to severe complications like diarrhea, disruption of pregnancies, internal infections and liver and pancreatic problems. Although most of these drugs have been FDA approved, they are not recommended due to the health problems they could create on top of PF. The use of systemic enzymes is a lesser-known healthy natural supplement for pulmonary fibrosis that has been gaining some ground in the medical world. This is especially attractive for women that are pregnant or people who suffer from other medical conditions that pose a higher risk for treatments like drug therapy that involve harsh chemicals. Systemic enzymes taken orally can help break down the fibrin that causes your lungs to scar. This allows you to breathe more normally over time. The enzymes used in systemic enzyme therapy have been used by naturopathic doctors all around the world for decades. Although it is not guaranteed to work for everyone, this natural approach to treating PF comes with little to no risk and is therefore worth a try for those looking for a chemical-free form of relief. It makes sense to use something our body naturally produces to function better as an aid in an area where it is struggling to perform. Palliative care is often reserved for the most extreme cases of pulmonary fibrosis. Care like this often involves counseling and end-of-life treatment plans and services like hospice. It is important that anyone diagnosed with this chronic disease receive this kind of care at some point, even if it’s alongside other types of treatment like curative care. Who Offers Pulmonary Fibrosis Care? There are several experimental medical research centers, professional clinics and well-known hospitals that are provide top pulmonary care. 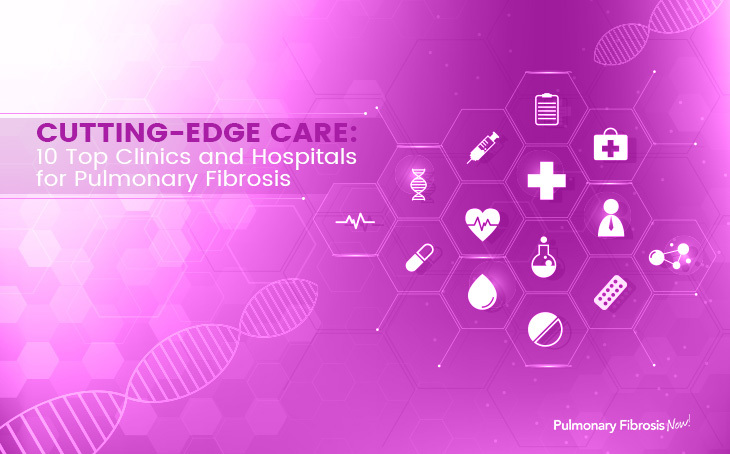 If you think you may have this disease or if you have already been diagnosed and are looking for a treatment facility, here is a list of the top 10 clinics and hospitals that provide cutting-edge care for pulmonary fibrosis and other lung diseases. This academic medical research facility is in Denver, Colo., and is known as one of the top ground-breaking research and treatment centers for adult pulmonology. According to the U.S News and World Report, this facility has been the leading respiratory hospital in the nation for over 16 years. The doors have been open to patients since 1899, and to this day it remains a non-profit organization that treats people regardless of whether they have health insurance. There are several branches of Mayo Clinic that treat pulmonary fibrosis, but the most well-known for its special focus in adult pulmonology is the clinic located in Rochester, Minn. This Mayo Clinic is known for treating a high volume of severely at-risk patients, and it consistently receives an excellent score in survival odds and patient safety. It also has a large nursing staff, an adult intensive-care unit, excellent patient services and highly advanced technology like multislice spiral CT scan and transplant services. They have been named one of the best hospitals for treating pulmonary fibrosis patients for the past three years in a row. Cleveland Clinic in Cleveland, Ohio, is a general medical and surgical facility that has been consistently ranked at number 2 on the national hospital honor roll and number 3 in the specific area of pulmonology. They are well known for their excellent treatment of chronic obstructive pulmonary disease and lung cancer. Their non-invasive breathing aids for pulmonary patients provide comfortable respiratory support and fall right in line with the rest of their cutting-edge technology and care. This general hospital is in Boston, Mass., and is known for its top-of-the-line pulmonary rehabilitation services. They are also high-performing in chronic obstructive pulmonary disease treatment and lung cancer surgery. Unlike many of the other medical institutes that focus on pulmonology, Massachusetts General Hospital has a section for pediatric pulmonology as well as adult. Shadyside is in Pittsburgh, Penn., and is consistently highly ranked for psychiatry, rehabilitation and pulmonology. All three of these areas are important for excellent PF care. UCSF is in San Francisco, Calif. The center has been known for its high performance in lung cancer surgery and PF treatment for the past three years and employs several high-ranking specialists. This facility is in Ann Arbor, Mich., and has a specific division for pulmonary and critical care medicine and research. They provide both inpatient and outpatient care and are known for the NIH grant-funded research center that focuses on pulmonary inflammation, injury, repair, fibrosis, host defense, lung transplantation and lung cancer. Barnes-Jewish Hospital is in St. Louis, Mo., and provides pulmonary medical services for over 10,000 patients and 5,000 outpatients a year. They specialize in lung transplants, interventional pulmonology, lung volume reduction surgery and lung cancer surgery. This facility is in Philadelphia, Penn. It has been ranked number 10 on the national hospital honor roll list for the past two years and number 9 in pulmonology for almost as long. Its specialties in the lung disease area lie in lung cancer surgery and chronic obstructive pulmonary disease, with above average survival rate ratings and excellent inpatient and outpatient services, as well as highly advanced technology. UCLA has several medical centers throughout California, but the pulmonology-focused center is in Los Angeles. Out of all the facilities mentioned here, this branch of UCLA has one of the largest varieties of lung disease treatment options out there. The center comprises an asthma and cough center, a center specifically for chronic obstructive lung disease, a pulmonary fitness and rehabilitation program, a pulmonary sleep medicine program and more. It also partners with the Pulmonary CCM Fellowship for training.